My back keeps seizing up, what exercises are best for me to do? Clinical Pilates is the answer! If you keep having episodes of your back 'going' it is because your stabilising muscles are not working properly to support your spine. After an episode of back pain the core stabilising muscles become inhibited by the pain and stop functioning the way they are supposed to. This weakens the back and can make your back very susceptible to further episodes of pain. The core stabilising muscles jobs are to support the spine and stabilise the spine during movement. If they have weakened then they are not able to do this. Think of your body as having either stabiliser muscles that control the movement of a joint, and mobiliser muscles that perform a movement at a joint. The stabiliser muscles are responsible for holding the joint stable as we move and the mobiliser muscles move the joint. The core stabiliser muscles act as a cylinder around the spine to support trunk movements. 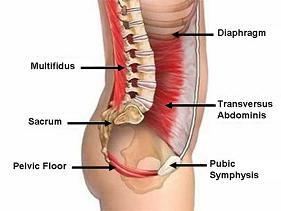 They are transverse abdominus, pelvic floor, multifidus and diaphragm. They have direct spinal attachments. They activate before you move and stay on at low intensities as you move. From the first episode of back pain the way these stabilisers work changes. They have a delayed activation and they turn on and off as you move. They work in short bursts rather than staying on as you move. Your body will tend to compensate for this and try to use the mobiliser muscles instead of the stabilisers. This isn't what they are designed for and therefore this can actually cause more pain and problems. When the stabilisers are not functioning well your back is vulnerable to 'going' or 'seizing up' at any time. It doesn't even have to be anything strenuous to make your back 'go' even picking up a piece of paper could do it! In clinical Pilates we retrain the stabiliser muscles of the trunk. I can teach you how to properly active the muscles and train them to stay on during movement. Try our 14 day free trial here.